Over the years, bathroom mirrors have become more than just a practical essential for everyday grooming. These days, as well as their day-to-day use, mirrors accentuate the decor of the bathroom, with striking designs and modern functionality. Our range of bathroom mirrors are built to be used, but also look stylish, and come in a variety of shapes and sizes. Whether you’re looking for a mirrored cabinet or a simple mirror to hang above the basin, we can offer high quality, reliable products. Whichever option you go for, a bathroom mirror will help your room feel more spacious and airy, and can provide you with more light. 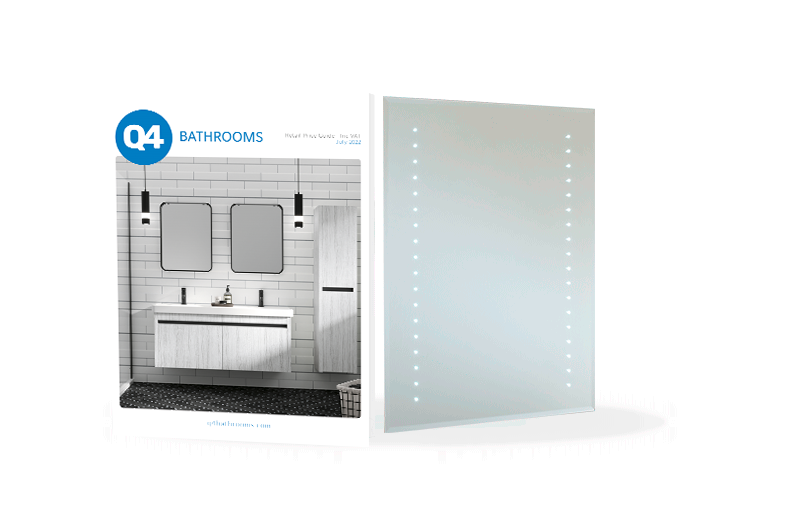 Our contemporary LED bathroom mirrors come with energy saving technology, but if it’s the modern bathroom mirror you want, why stop there? We offer mirrors with high-tech built-in features such as shaving sockets, bluetooth speakers, demister pads, infrared sensors, and dimmer functionality! Why buy bathroom mirrors from Q4?